Eugene and Clare Thaw owned the Wind River Ranch in northern New Mexico. The ranch includes 4,224 acres of grassland, piñon/juniper and ponderosa pine woodlands. About five miles of the Mora River flow through the middle of the ranch, and the river has carved a canyon that is about 300 feet deep. The landscape – within the transition zone of the Sangre de Cristo Mountains to the west and eastern plains – is valuable to nature and ecologically important. The Thaws were from New York, but they first came to New Mexico because Eugene was an Executor for Georgia O’Keefe’s estate. When Eugene retired in New York, they moved to Santa Fe, and they also bought the Wind River Ranch in Mora County as a recreational ranch to complement their Santa Fe home. In 2004, Eugene decided that he wanted the ranch to serve a societal benefit. He offered the land to the Wildlife Conservation Society (WCS) of New York. WCS staff asked me to come to the ranch and start programs as their employee, but the Board of WCS rejected Eugene’s offer. Eugene liked the ideas I proposed on conservation of native species and ecosystems, conservation research, restoration, and education, so he started the Wind River Ranch Foundation to implement the plan. I started in January of 2005 and we began the programs that year. Eugene wanted to donate the ranch to an NGO, and he offered it to several organizations between 2007 and 2010, but the economy of the times made NGOs reluctant to accept the land without a full endowment. In 2010, Eugene became discouraged with the idea of donating the land, but the US Fish & Wildlife Service (USFWS) stepped forward and said the it would purchase the land for a National Wildlife Refuge. They would rename it Rio Mora National Wildlife Refuge (NWR), and would maintain the programs and partnerships started as Wind River Ranch Foundation. Eugene said that if USFWS did that, he would donate the land. 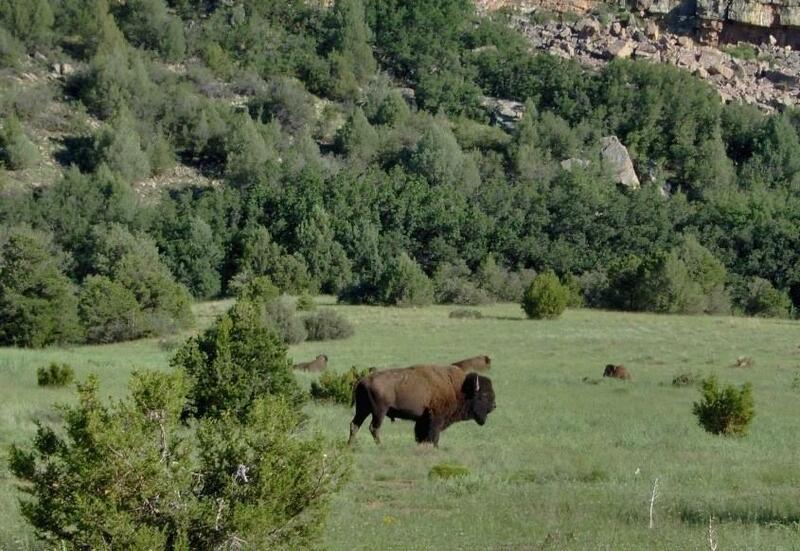 Importantly to us, that meant maintaining the Refuge for native species only and continuing the ability of the Pueblo of Pojoaque tribe to graze their bison on the land. In September of 2012, the Wind River Ranch was accepted by the USFWS to become the Rio Mora National Wildlife Refuge. Rio Mora became part of the Northern New Mexico Wildlife Refuge Complex, along with Maxwell and Las Vegas (NM) National Wildlife Refuges. Rio Mora NWR became the core of a 1,000,000-acre USFWS Conservation Area in the Mora River Watershed, meaning that the Service could facilitate up to 300,000 acres in land acquisition or easements without additional public meetings. Unfortunately, between 2010 and 2012, the USFWS suffered budget cuts, and by 2012 the Service had no budget to operate Rio Mora NWR. Eugene then donated $1,715,000 to Denver Zoo to staff and manage the Refuge for USFWS. Programs were still being driven by grant-funding, but the donation to Denver Zoo (and thus indirectly to the USFWS) meant that programs could expand greatly in number and efficiency. The management of Rio Mora became a partnership among USFWS, Denver Zoo, Pueblo of Pojoaque tribe, and New Mexico Highlands University (NMHU), an Hispanic-serving institution. The partnership, and the resulting programs, are best summed up as the Rio Mora Conservation Science Center at Rio Mora NWR. Since 2005, our science emphasis has been on applied conservation knowledge that could be used on lands outside of Refuge boundaries. This fits well with our role in the larger USFWS Conservation Area. Research with direct conservation value, i.e., restoring ecosystem function and protecting native species, are priorities. Our efforts at restoring grasslands and wetlands will help buffer the area from changing climate. To date, we have hosted 29 studies for an MS, two for a Ph.D., one post-doc, and 12 by working biologists. 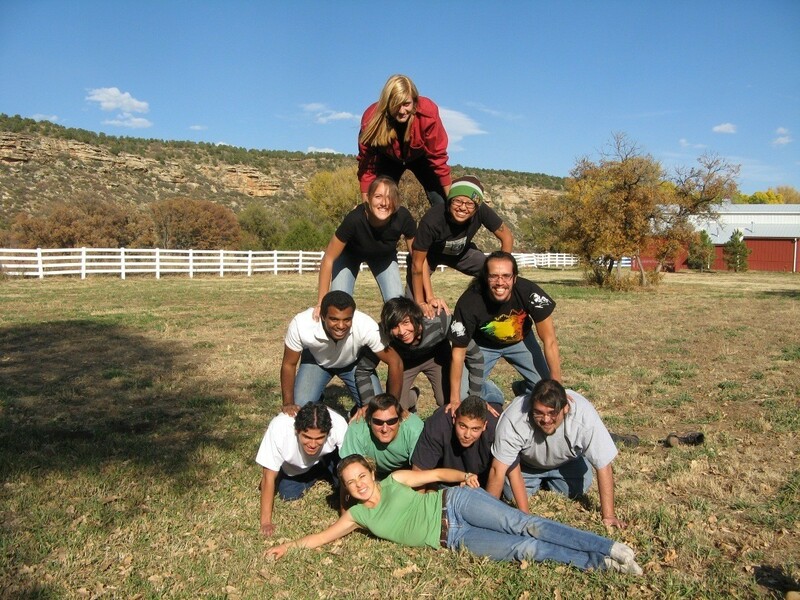 We have hosted over 55 internships funded by Denver Zoo, NMHU, and the Bureau of Indian Affairs. We have hosted international interns from Mexico and Haiti. While these numbers are modest compared to older research centers, we have a small staff, which after 2012 grew to 3.5 FTEs. Once funding becomes secure, we would like to start a large-scale study comparing flora and fauna on bison-grazed land and cattle-grazed land. In addition to research, we monitor our flora and fauna annually. We were named an Important Bird Area by Audubon, and approximately 80% of our summer residents eat insects at some level, so the relationship of insects and birds is important to us. Some of this monitoring is done by citizen science. Trophic cascades and how exotic species transform landscapes are other areas of interest. 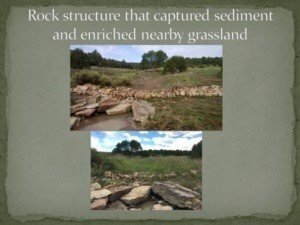 In restoration, grade control rock structures in arroyos raise the water table, recharge springs, and restore degraded wetlands. We have built over 400 such structures. We are monitoring changes in soils, moisture, vegetative recovery and wildlife use in restored arroyos, and comparing those variables in arroyos not yet restored (but soon to be). Arroyos across sloping grasslands (typically formed by legacy ranch roads) disrupt the natural water flow across the landscape and deprive grasslands down-slope of the road of needed moisture. 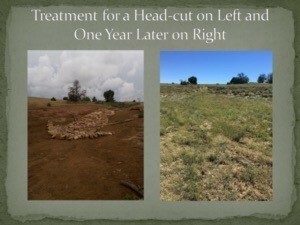 One study explores a technique to get water out of the old roads and back onto the down-slope grassland. We are measuring the responses from this increased moisture down-slope in density, diversity, and biomass of the grasses. The Mora River has incised and has been disconnected from the floodplain. That has lowered the water table and eliminated important riparian habitat. We used Bill Zeedyk’s techniques to successfully restore the river meander, restore structure to the river floor, and recreate floodplains. Rio Mora NWR plays a strong role in STEM education for New Mexico youth and university students. Thus, New Mexico Highlands is a strong partner. Since 2005, over 5,000 students from 19 school districts and 11 universities have come to the Refuge on pre-arranged visits to learn about conservation challenges and to participate in citizen science research. Hands-on place-based education is instrumental in attracting and retaining students in STEM majors. We run a competitive seasonal internship program every year. We have multi-year university-accredited programs running from several Colorado-based colleges/universities. Among the 1173 visitors hosted in 2018, 88% were “New Mexico True.” This is important to us and to the local community. New Mexico is 50th in preparing high school students for college and 49th in education. Only about 60-65% of a freshman class in Las Vegas graduates after four years. San Miguel County has a median income of $29,000 and Mora County has a median income of $21,000. Rural New Mexico remains a forgotten area, so a majority of Rio Mora staff resources are spent locally. Our partnership with the Pueblo of Pojoaque tribe is strong, and it is unique in the National Wildlife Refuge system. The Pueblo of Pojoaque bison herd also serves other southwestern tribes. The herd provides ecological restoration on the land and cultural restoration for the tribe. We will host in June 2019, as we did in 2018, two of the largest tribal youth camps in New Mexico. 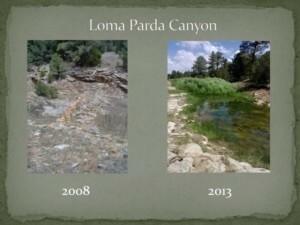 In sum: we do conservation work with strong community support. When USFWS hosted three public meetings about Wind River Ranch becoming a National Wildlife Refuge, 200 people attended. There was no opposition, rather local and tribal people stood and endorsed our efforts. When Wind River Ranch became the Rio Mora NWR, the local newspaper, The Las Vegas Optic, rated that change as one of the top ten events of 2012. It isn’t often that a rural, western newspaper thinks the feds getting more land is a good thing. The Thaw donation to Denver Zoo will expire at the end of 2019. We will do everything possible to raise the funding needed to keep the programs going. That is our immediate task. Visit our website. We welcome your support. Brian J. Miller received a PhD from the University of Wyoming in behavioral ecology and conservation of black-footed ferrets and was then awarded a Smithsonian Institution Fellowship at their Conservation and Research Center. Brian worked with the conservation of the endangered black-footed ferret for a decade, then lived in Mexico for five years beginning an ongoing research project on jaguars and pumas in the dry tropical forest of Jalisco, Mexico. After seven years as a Coordinator of Conservation and Research at the Denver Zoological Foundation, Brian accepted a position to develop conservation and education programs at the Wind River Foundation. His main research interest concerns the role of highly interactive species (keystones) in regulating ecosystem processes, and how to improve protection for those species when designing reserves. He has published 100 scientific articles, four books, and has been on the board of five conservation organizations. He has helped start two protected areas, one of which is Rio Mora NWR. In 2009 he was given the Denver Zoo’s Annual Conservation Award. So glad to read this concise history. When I visited there a number of years ago – long before the NWR – a mountain lion crossed the road as I came down into the valley, the only one I’ve seen in the wild. Many thanks to all the players in this demonstration of what persistence and collaboration, and of course some money, can do for conservation and restoration.